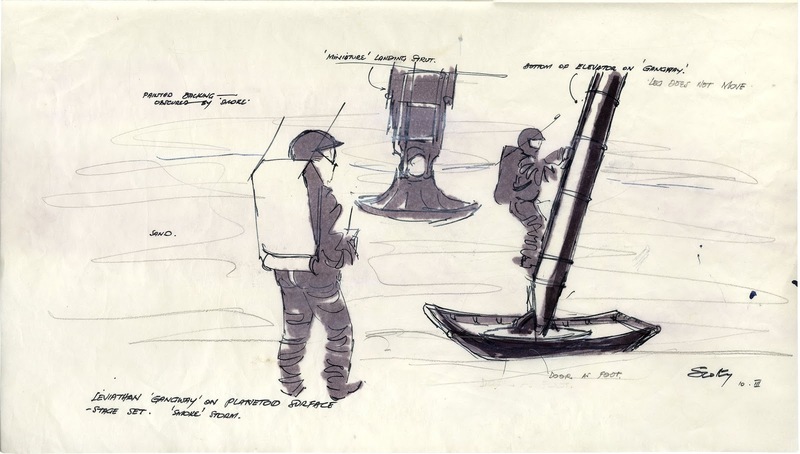 a) Another artist Elliott Scott worked on a series of concept drawings supposedly in March of 1977 , basically showing scenes from the script from the time it included and ancient Red City part of which would have been filmed in Petra in Southern Jordan. Curiously in some of these illustrations, Ripley shows up as a female character. One might wonder if these were done in 1978 when that decision to make her female appeared to be made.These were in the possession of "Alien" executive Peter Beale until he auctioned them in 2017 at http://natedsanders.com. b) Leviathan exterior and interior. Leviathan peculiarly becomes a vast rocket spacecraft shaped like a tuning fork with a sphere in the form. The inside is divided into smaller areas for humans to live in and vast chambers for storage and the engine rooms. The control and the hypersleep vault might be seen to be the interesting images from the collection, but mostly they appear to be derivative of the films that seemed the most popular at the time, such as Forbidden Planet, 2001 A space Odyssey, perhaps even Barbarella. The idea of the design of the Hypersleep vault would bleed into the Nostromo interior , and perhaps the corridors drawings as well. 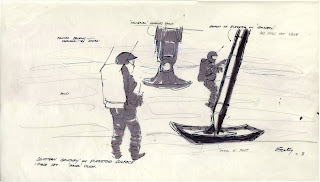 This shows that Scotty was working on concepts to do with a black ship that would be part of the Cylinder script, however the one shown here seems to be an alien looking spherical vessel surrounded by bands. While this alien derelict ship seems very simple and abstract, the way it might reference the famous painting Philosopher lecturing on the orrery by Joseph Wright of Derby appears to be very interesting. Instead of the concrete bunker and also the city found in another script, here known as the Red City, with Petra being thought of as a location for some of the scene.